Recovering Working Mom: On the third day of Christmas . . .
. . . Mommy’s going to take one more quick diversion. Today the girls and I and their girl scout troop attended a “Wreaths Across America” ceremony. Across the country 150,000 people laid 400,000+ wreaths on the gravesites of soldiers in National Military cemeteries. This was such a special thing to participate in, and in light of the events of yesterday was more solemn and meaningful. This is the girls before we laid the wreaths. Again, take a moment to continue to remember those who have made the ultimate sacrifice. 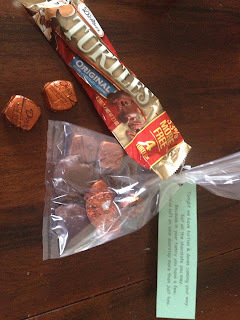 Little turtles with Dove chocolates. Tonight we have turtles with dove chocolates coming your way. They've eaten all the chocolate they may. mommy would let them eat no more than two. Lesson learned about this photo - DO NOT ask the baby to put candy in her mouth, turn your back to get a different camera and expect that candy to still be there. She couldn't be trusted, so she had to have the bag in her mouth!!! Tonight we have turtles & doves coming your way. Eat all the chocolate you may. We've left on your doorstep more than just two. Tres Princesse two smiling, one not. Lesson learned from this photo - 1) DO NOT send the picture to the grandparents from your phone in a hurry - you will forget the poem and will screw it all up; and 2) DO NOT piss off the baby right before you are trying to take the photo. Pissed off does not begin to describe this child's mood! We must have taken 15 shots before daddy made mommy give up. 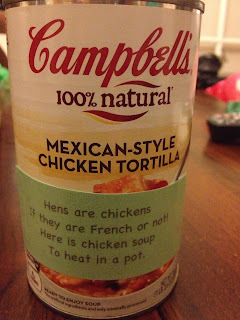 We couldn't find French chicken soup, so we thought Mexican Chicken Tortilla would be hilarious! If they are French or not! To heat in a pot. Again, hug those babies tight, appreciate every moment, say I love you lots, and embrace the miracles that will come from the tragedy of yesterday. I saw a story of a father whose child was taken from him too soon, and yet all he speaks of is forgiveness and compassion. May we all have that much courage!